The Hornsby Council team hard at work on the Mountain Bike Trail – note the ride wall in the background. 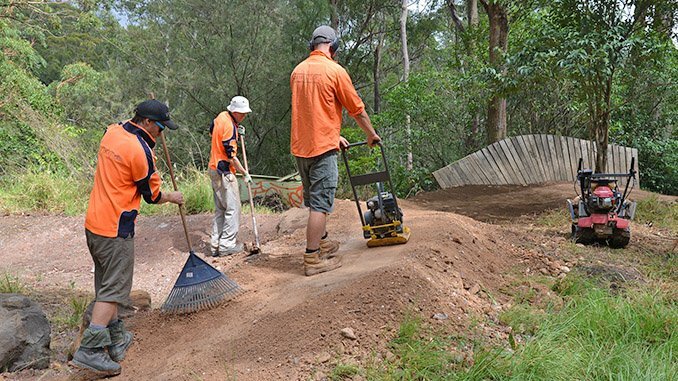 The project to realign Hornsby Mountain Bike Trail has been delayed and the trail will not open until 2017. The trail is being realigned so it does not have to close when work starts next year to partially fill Hornsby Quarry with dirt from the NorthConnex tunnel. “It’s a real shame because we were pushing very hard to have the trail reopened by the holidays,” Hornsby Shire Mayor Steve Russell said. Nobody is more keen to see the trail reopened than Sydney North Off Road Cycling (SNORC) President Campbell King, who played an instrumental role in its original creation. “The delay is disappointing, of course, but these things happen and we understand the complexity of the NorthConnex project,” Mr King said. The first part of the completed trail is expected to reopen early in the new year.